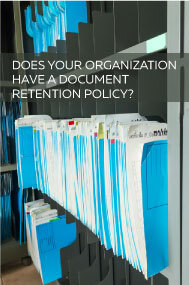 What is a Document Retention Policy? A document retention policy (DRP) is a well thought out policy outlining the review, destruction or retention of documents your business has received and generated. A DRP is prudent for many reasons including efficiency, protection in litigation and compliance with laws and regulations. Practically speaking, a DRP decreases the amount of on site and off site storage expense. In fact, it’s safe to assume that most companies retain too much for fear that the documents destroyed will be the very ones needed at a later date. It is also more efficient; when employees have written guidelines for how long various types of documents need to be kept it takes the guesswork out of making those decisions and helps prevent “document hoarding”. From a legal aspect, having a written policy that is followed by all may protect your company in a variety of ways in the event of litigation. Compliance with governing regulations specific to your industry is another area where a defined policy is necessary to ensure all supportive documents are maintained and available for audit purposes. One area that most companies currently have a pattern if not a documented policy is the area of tax documents. Refining that policy to ensure that documents are not retained longer than necessary would be a good place to start since there are defined policies about limitations and deadlines. Employment records is another area that most companies already have a good start toward a retention policy with practices that are currently in place due to state and federal regulations. The first step is to determine that you need to do this as a company. A good, second step is to outline your company’s document categories based upon your industry or profession. Following that you might begin researching the applicable regulations, policies and statutes of limitations for each category that could affect your business from a legal standpoint. DOWNLOAD PDF – Do you need a Document Retention Policy? If you are ready to take on this project, along with legal counsel, the MSL SafeSource team is happy to help you identify the relevant documents and schedule to develop an appropriate retention policy for your organization. Why Outsource Accounting and Finance? Independent Contactor or Employee – How do you know?